1.1 The purpose of this university policy is to name the symbols that are used to identify Wayne State University and to specify the use of those symbols. The Warrior W is a primary mark/logo for promotion and communication materials of Wayne State University. It should be given first consideration when a logo is used. The wordmark can be used when communication is more formal in nature, or when readability or size constraints are an issue. 3.1 The goal of all Wayne State units should be to reflect a consistent identity standard and use the primary mark as the focus. However, in instances where a supporting program or unit needs to be identified, the name of the school, college, department, unit or program can be placed below the Primary mark. This treatment is considered the official logo. All other graphics that exist outside of this standard are not official logos and will not be recognized by the university as such. 4.1 The university seal is the official symbol of the university. 4.2 The Secretary of the University shall be the custodian of the university seal and shall affix it to documents to attest the contractual authority of executive officers of the university or their designees, to certify action of the Board of Governors, and for reasons required by law. 4.3 The seal shall be mounted on a device that will produce an embossment for purposes stated in section 4.2. The device is known as an "embossing seal" and shall exist in the Office of the Secretary only. 4.4 Written requests to use stick-on seals on documents for ceremonial purposes shall be sent to the Secretary of the University for approval and shall state the purpose of the document, with a copy attached. The request shall be signed by the officer with jurisdiction over the document (dean, director or executive officer). 4.5 The university seal in printed form shall be used on university diplomas, and may be used on special citations and on other forms of recognition in connection with university awards, upon the approval of the Secretary of the University. 4.6 Arrangements for the printing of the seal shall be made through the Office of Marketing and Communications. 5.1 Spirit marks are intended to be used when the primary mark, the Warrior W, cannot be used due to space, readability, or color concern. Spirit marks can be combined with other graphics but do not replace the Warrior W as the official logo. 5.2 Specially designated seals for specific units of the university may be used, with the approval of the President, to validate enrollment, transcripts, out-of-state bar certification, guest applications, and for awards issued by schools, colleges, offices and departments. Written requests for specially designated seals shall be sent to the Secretary of the University and shall specify the intended use of the seal. 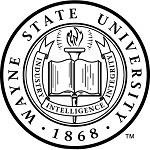 5.3 The design of specially designated seals shall bear the name "Wayne State University" and the name of the unit. 5.4 The Secretary shall review requests and consult with the Office of Marketing and Communications on the design of the proposed seal. 5.5 Seals shall be issued only upon the recommendation of the Secretary of the University. 5.6 Arrangements for the design of approved seals shall be made through the Office of Marketing and Communications. 5.7 Specially designated embossing seals shall be maintained in a secure location, and the units shall designate a person to be responsible for the seal and shall report annually the name of that person to the Office of the Secretary of the University by the fourth Friday of September. 6.1 Warriors is the university's official nickname for Wayne State University athletics. 7.1.1 University symbols may be used for merchandise and decorative purposes on chairs, tables, signs, coffee mugs, water glasses, , pens, pencils, banners, ties, sweat shirts, or other similar items, upon the approval of the Office of Marketing and Communications. 7.1.2 University symbols may be used for decorative purposes on building surfaces upon the approval of the Office of Marketing and Communications. 7.2.1 University symbols identified in this university policy may be used for commercial purposes (e.g., chairs, tables, signs, coffee mugs, water glasses, pens, pencils, banners, ties, sweat shirts, or other similar items) upon the approval of the Office of Marketing and Communications. 7.2.2 Written requests for commercial use of university symbols shall be sent to the Office of Marketing and Communications. 7.3.1 Requests from external persons and/or organizations, including vendors, for the imprinting of university symbols and special seals on articles for commercial or noncommercial purposes shall be directed to the Office of Marketing and Communications. 7.3.2 Specific units of the university and university affiliates, upon design approval by the Office of Marketing and Communications, may order articles for noncommercial purposes with the imprinting of the university symbols and other special seals consistent with university purchasing policy. 8.1 Section 7.2 does not apply to routine office supplies with university symbols that are used to execute the day-to-day business of the university. 9.1 This university policy is revocable at any time at the discretion of the president and without notice. 10.2 This University Policy supersedes University Policy 2001-8, First Release.